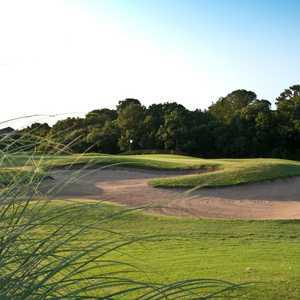 GRAPEVINE, Texas -– Just east of the Grapevine Dam, a 10-minute drive from Cowboys Stadium -- site of Super Bowl XLV -- sits a 27-hole facility known simply as Grapevine Golf Course. 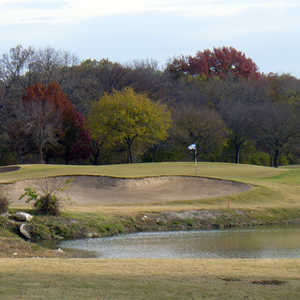 The Mockingbird nine at Grapevine Golf Course opens with a long par 4. And yes, it's a municipal course, thought that's not a point of emphasis at Grapevine, which opened in 1979. "It seems as though the stigma associated with the word 'muni' has always had a negative vibe to it," said Russell Pulley, Grapevine director of golf. "Even though we are owned by the city and proud of the city of Grapevine, we try not to use the term 'muni.'" You can understand Pulley's sentiments, but the golf course and facility, which hosts 65,000 rounds per year, combines the best elements of a muni and a high-end daily-fee facility. The pricing, access and relaxed feel are typical of a municipal golf course. They don't encourage T-shirts at Grapevine Golf Course, but they don't frown on changing into your golf shoes in the parking lot, either. At the same time, conditions, design, quality of food at the grill and customer service rate as good or better than most daily fees. It stands out most in the quality of the golf course. Originally an 18-hole layout, the golf course was designed by Joe Finger and the legendary Byron Nelson. The original 18 holes, made up of the Pecan and Mockingbird nines, is a par 72 that plays to more than 6,900 yards from the back set of four tees. There are plenty of bunkers, water hazards and tree-lined fairways on holes that often dogleg. Nelson didn't design many golf courses, but he left his mark on this one. The Pecan's third hole, in particular, carries his legacy. He insisted on keeping a large pecan tree near the green. If you come in from the left side, it will stand in your way. A little more than a decade ago, longtime PGA Tour pro D.A. Weibring and his Irving-based design firm, Golf Resources, Inc., added nine holes, now known as the Bluebonnet Nine. The new nine, which has more elevation change than the original golf course, opened in 1999. Combined with the Pecan nine, it plays longer than 7,000 yards. A newly renovated Mockingbird Nine, also designed by Weibring, reopened in 2002 with the Pecan's renovation completed a year later. The result is 27 holes with new, modern Tif-Eagle greens and plenty of challenging holes. "Our goal is to create a reason for you to come back a second time by offering you, the player, the best playing conditions and test of golf at a very reasonable rate," Pulley said. "You can find cheaper but not for the quality that we offer. The difficulty of the golf course can be whatever you, the player, would like to tackle, depending upon which set of the four tees you choose." About the only thing problem with Grapevine Golf Course is that it's just too hot in the summertime in the Dallas-Fort Worth area. So get your tee times early in June, July and August. Otherwise, conditions are superb; the golf course is interesting, and it will certainly test your skills. The original 18 includes plenty of good holes. And from the tips, it's anything but easy. Many of the holes force players to work the ball, especially right to left. The new nine, though not out of character with the original, feels different. Some holes, like par-5 fifth, feature something close to a links feel. The facility has excellent practice and dining facilities. There's a large grass range, a putting green and short game area. 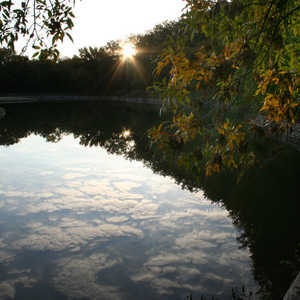 Lessons are also available from the professional staff, and Grapevine Golf Course offers both adult and junior clinics. All considered, Grapevine Golf Course ranks as one of the better municipal golf courses in the state, much less the DFW area. The city of Grapevine features a number of quality hotels near Grapevine Golf Course, including the Gaylord Texan Resort and Convention Center, where the Dallas Cowboys stay the night before home games. The giant, Texas-themed hotel has four distinct areas inside a dome, including a facsimile façade of the Alamo among its indoor gardens and waterways. Offering fine restaurants as well as a sports bar with a 50-foot big screen, the Gaylord Texan has partnered with Cowboys Golf Club for stay-and-play-packages. You could also stay at the nearby Embassy Suites Outdoor World at DFW, less than two miles from DFW International Airport, an all-suites hotel that includes complimentary breakfast and a daily manager's reception. The hotel is connected to a giant Bass Pro Shop complex, where you'll find everything outdoors, including golf equipment. The city of Grapevine, next to Arlington and Fort Worth, has become a destination of its own in recent years. Downtown is loaded with choice restaurants and tourist attractions, including a couple of wineries and a memorial to the flight crews of the downed Sept. 11, 2001, airplanes.